Bob Weiss staggered out of baggage claim, squinting into the canned light of the airport in the city of Taiyuan, where a nervous young man awaited with a large bouquet of flowers. The man was the general manager of the Shanxi Brave Dragons, the last-place team in the Chinese basketball league. Weiss, a four-time head coach in the NBA, had been brought to central China as part of a radical experiment. He would become the first former NBA head coach in China. And he had not come merely as a coach. He was supposed to be a savior. “Welcome to Taiyuan,” the general manager said in Chinese, as the team’s interpreter translated for Weiss and they walked into the hot evening air for the ride to Weiss’s hotel. They soon arrived at one of the tallest skyscrapers in downtown Taiyuan, a glass building, unremarkable except that the glass was tinted the color of a ripe banana. It was too dark and Weiss was too exhausted to notice the color, but what seemed familiar was the Howard Johnson sign shining atop the building, an emblem of unpretentious Middle America gleaming in the central China night. Weiss took comfort in the sign. So much was already unfamiliar: He had moved to a city whose name he could barely pronounce to coach a team he knew nothing about, other than that it was very, very bad. He had not understood anything anyone had said to him since arriving in China less than eight hours ago, and still had not met the man who hired him, the team’s owner, Boss Wang. Weiss rode the elevator to his room, and opened the door and walked in. The overstuffed furniture was old and stained and crowded together in the small room. He smelled the acrid odor of stale cigarettes. There was a combined bedroom and living room, and the tiny bathroom appeared to be missing essential parts. There was a small sink and toilet, but the shower nozzle poked out of a wall next to the toilet. There was no tub or shower stall; the entire bathroom was the shower stall. When Weiss flipped on the water and stepped under the nozzle, most of the water sprayed upward, where it performed a bank shot off the ceiling before splattering down onto Weiss, the toilet, the sink, and the rest of the bathroom. His shower had flooded the bathroom. Weiss flicked on the television. He had been promised international cable service, but every channel was Chinese, except for one with news updates from Canada. He opened his Apple laptop, but the room lacked the promised Internet connection, so he collapsed on the bed, disconnected from the world he had known, and fell asleep. When he awoke in the morning and stepped outside, he learned two things: He was living in a yellow skyscraper. And the Howard Johnson was not actually a Howard Johnson. The familiar Howard Johnson sign sat atop the yellow building, but a less conspicuous English sign above the door identified the hotel as the Howell & Johnson. Bob Weiss had spent his first night in China at a knockoff HoJo. Boss Wang was sixty-one, but looked younger, with tousled black hair that fell onto his forehead. He had a thick chest and thick hands, and his appearance was a little rough, unfinished. He didn’t smile very often; he eyed most people as if they might take something from him. He looked more like the son of a peasant farmer he was, rather than the steel baron he had become — one of the richest men in China. Forbes had estimated his wealth at roughly $260 million and ranked him as the country’s 236th richest person, though gauging wealth with any precision is nearly impossible in China. What could indisputably be said was that money had showered down on China during the previous decade; it had sprinkled over hundreds of millions of people, enough to lift many of them out of aching poverty and push them, tentatively, into better lives. But for a smaller group, the money had poured down as if in a deluge, and this new Chinese class had become as fabulously wealthy as the most fabulously wealthy people in the world. They had bought Ferraris or built nouveaux riche mansions. Boss Wang, on the other hand, had bought a basketball team. His team, the Shanxi Brave Dragons, represented an ongoing experiment that, if judged by the results on the court, was an abject failure. The Brave Dragons were the worst team in the Chinese Basketball Association. Last season, they had won five games and lost 24, and two of their wins had come by forfeit. Among many of the general managers, players and reporters who followed the league, Boss Wang was regarded as just short of a madman, a meddler who had fired fifteen (or sixteen?) coaches since buying the team in 2002. He had fired a Korean coach, an Australian coach, and a dozen-plus Chinese coaches. He had been fined repeatedly for his outbursts during games, and although league officials appreciated his dedication to the sport (and the money he was willing to pour into it), they were probably relieved that his team was far away from the media spotlight, in Taiyuan, the capital of Shanxi Province, at the heart of the nation’s polluted coal belt. Boss Wang hardly felt shamed. He had a sharply critical view of most Chinese coaches, considering them too stubborn, too close-minded, to embrace the concepts he saw when he watched NBA games on Chinese television. He studied NBA games, watching the way Steve Nash or Chris Paul seemed to move effortlessly down the court, as if running atop some unseen conveyer belt, spinning toward the basket or dishing perfect passes out to shooters on the wings. He would charge into a Brave Dragons practice, shouting and directing his players, trying to teach them how to do what he had seen on television, but he was always disappointed. He wanted to transplant the NBA game onto the Chinese court but he didn’t think a Chinese coach was capable of doing it. “He said no Chinese coach can understand his ideas,” the general manager told me. Boss Wang had never heard of Bob Weiss when Weiss’s name turned up in his NBA coaching search, but that didn’t matter. What mattered was that Weiss was NBA, and Boss Wang had decided to be the first Chinese owner to hire a former NBA head coach. He wanted a coach with a higher basketball consciousness, someone who understood the game the way he did. Just as Chinese factory owners wanted the latest piece of equipment from the West, Boss Wang wanted his own technology transfer, an NBA coach. He offered $50,000 a month for Weiss, sight unseen. Now, six months later, Weiss stood on the sideline, near the scorer’s table, a good fifteen feet from the bench as his Shanxi Brave Dragons took on the Tianjin Golden Lions. He was keeping his distance from the bench because Boss Wang was sitting there, trying to coach the team. By now, Weiss had figured out that Boss Wang’s experiment moved in unpredictable directions, including the team’s latest addition, the former NBA forward, Bonzi Wells, who was about to play in his first Chinese Basketball Association game. Wells had created a sensation in China’s sports world when he arrived in Taiyuan a week earlier. He was already being called The Greatest American Ever to Play in the Chinese league, even as many Chinese fans were wondering: How did he end up with a backwater team like the Brave Dragons? Tonight’s game was supposed to be the headline event in the Chinese league, except that a heavy snow was coming down outside, limiting the crowd to a few hundred diehards, including about fifty men who were beating thunder sticks for Bonzi. The arena was large, frigid, and mostly empty, with an oval concrete floor, an awkward configuration for the rectangular court. It was like watching a basketball game inside a very large indoor rodeo, minus the fans and cows. The Brave Dragons were introduced. Olumide Oyedeji, a 6’10” center who had once ridden the bench for the Seattle Supersonics, loped onto the floor, greeting every teammate who followed with his customary chest bump. Like the rest of the team, Olumide was uncertain what to make of Wells. The team was wearing their red road uniforms, and Wells wore Number 42. When he was introduced by his Chinese name, he trotted out for his chest bump with the Big O. The Tianjin crowd exploded. No one appeared to be rooting for the home team. Wells stripped off his warm-ups and walked out to midcourt. The men with the thunder sticks were screaming. A few fans were wearing Rockets jerseys. Bonzi was thick in the chest and shoulders, overweight by NBA standards, but more heavily muscled than anyone on the court. He outweighed the Chinese player guarding him by maybe thirty pounds. When he played in the NBA, Wells’s role was clearly defined: to provide a burst of offense, often off the bench, as well as rebounding and some tough defense. In Taiyuan, he had asked Weiss about his role for the Brave Dragons. “They expect the Americans to play forty-eight minutes and get 30 points,” Weiss had said. “I play about thirty minutes and get about 15,” Bonzi had replied. Bonzi Wells would not have been America’s first choice as ambassador-at-large to China for America’s game. Gawen DeAngelo Wells, born in 1976 in Muncie, Indiana, had cursed coaches, cursed fans, cursed referees, brawled with fellow players (spitting on one) and had once been named by GQ magazine as one of the country’s “Top Ten Most Hated Athletes.” Any Chinese general manager combing the Internet would have found a damning rap sheet, a complicated blend of defiance and contrition, and at least one humanizing anecdote: He got his nickname from his mother because of her love of chocolate bonbons. In such a poisonous atmosphere, Wells earned a media reputation as a “bad chemistry guy.” In his first two seasons, he was fined or suspended at least five times, once for giving the finger to a fan and again for cursing the coach Maurice Cheeks after Cheeks removed him from a game, establishing a pattern of clashing with coaches, especially those with reputations as disciplinarians. He was suspended for spitting in the face of Danny Ferry (and for calling him a “honky”) and also suspended for being involved in a fight with an opposing player, Chris Mills, at the end of a game. His greatest moment as a player precipitated his greatest humiliation. By 2006, he was with the Sacramento Kings, thriving under the more relaxed coaching style of Rick Adelman, when the eighth-seeded Kings met the defending champion San Antonio Spurs in the first round of the playoffs. Expected to lose badly, the Kings pushed the Spurs to a deciding seventh game largely because of Wells, who averaged 23 points and 12 rebounds a game. Spurs coach Gregg Popovich called him “a one-man wrecking crew.” The Kings lost the deciding game, but Wells was redeemed, and at a felicitous moment. He was a free agent, and the Kings offered him a five-year deal for roughly $38 million, a major payday. He didn’t accept it. His new agent, William Phillips, reportedly pushed for $50 million and told the Kings that Wells had other suitors. Apparently, he didn’t, or at least not at that price. The Kings signed a cheaper player, and Wells fired Phillips. He signed with the Rockets for two years for a total of $4.5 million and was mocked for blowing the deal with the Kings (though he was hardly poor, having earned about $35 million in eight seasons). It was a hard thing to shake. He arrived in Houston overweight and had problems with Jeff Van Gundy, a coach with a reputation as a hardass. When Adelman arrived as coach the following season, Wells was jubilant, arriving in great shape and seemingly poised for a great season. But he suffered injuries and never found the right niche with the Rockets before being traded midseason to the New Orleans Hornets. His contract expired, and Wells had no other offers. His agent Bill Duffy first tried to place him in Spain, but after negotiations broke down he turned to China. When he played in Houston with Yao Ming (also represented by Duffy), Wells had signed a shoe deal with Anta, a Chinese brand that was a sponsor of the Chinese Basketball Association. His deal was part of the Yao effect: Almost any player on the Rockets was attractive to Chinese shoe companies, given the obsessive coverage of the team on Chinese television. But his trade to the Hornets complicated the deal; Anta had wanted him because he was a Rocket. Without an offer from the NBA, Wells and his new agent decided to come to China, partly because playing in the Chinese league might help resurrect things with Anta. It could also give Wells a chance to prove himself worthy of a second chance in the NBA, assuming he played well and could keep his head. Bonzi would admit to knowing almost nothing about China. He had initially thought his new team was in Taiwan, not Taiyuan, and his companion, Daphne, was excited to learn that Taiwan was an island with great weather. Wells had seen a video clip of the team and looked forward to playing with the team’s American swingman, the former Atlanta Hawk Donta Smith. He didn’t realize that he would be replacing Smith because the Chinese league only allowed two foreigners per team. He knew Weiss was the head coach, which was important, since an NBA coach would understand how to use him, and Weiss had a reputation as being a good guy, a player’s coach. He didn’t know that Boss Wang was making life hell for Weiss, sometimes turning the team over to a Chinese assistant who ordered the team to run endless layup and running drills. Bonzi had no idea he would be under such a microscope in China and greeted as such a giant star. He would later tell me he had figured he could do anything for a few months. Now the ball was tipped and the game was under way. The Brave Dragons came down the court. The starting five were point guard Pan Jiang, forward Ji Le (whose American nickname was Joy), forward Zhang Xuewen (known as Kobe because of his Kobe-inspired armband), center Olumide Oyedeji, and Bonzi at the other guard. They had barely played together. Pan pushed the ball across midcourt and passed to Wells. Everyone reflexively stopped moving and bore witness to the great star. He squared, launched his first shot in China and missed badly. Gradually, he found his game. He made a steal for a breakaway dunk. He slammed down a dunk and made a 3-pointer. Olumide drew two defenders and whipped a pass outside to Bonzi for another 3. He had scored 10 points in ten minutes. Bonzi was now shooting on almost every possession. Pan dribbled up the court, standing at the top of the key, waiting, until Bonzi came over and collected the ball. Everyone was frozen, intimidated, except Olumide, who was visibly frustrated as Tianjin crept back into the game, trailing 26-25. Timeout. Bonzi walked very slowly back to the huddle where the players were circled around Weiss. He was yelling at them as the interpreter, GM Garrison Guo, translated his rant into Chinese before the team returned for the last seconds of the first quarter. Weiss had called a clear-out for Bonzi to operate on his own and try to beat his defender for the last shot, but Bonzi fell down and the quarter ended with the Brave Dragons leading 29-27. Bonzi claimed he was fouled and argued with a ref. Bonzi shouted in English. The ref shouted back in Chinese. A pattern took shape: The Greatest American Ever to Play in the Chinese League was scoring but laboring, too. He did not have a natural shooting stroke; he had a hitch in his motion, and at one point tossed up three bricks in a row from behind the three-point line. He was shooting too quickly because he was exhausted and did not want to waste energy by driving to the basket. Still, as the game had progressed, he had put the Brave Dragons up 64-55 with a nice spin move. He hit a 3-pointer, missed one, and then hit one at the buzzer before the end of the third quarter. He had 30 points and the Brave Dragons led 82-67. His fans were beating their thunder sticks as the two teams walked out for the final quarter. Victory seemed secure. The game commissioner pointed at Bonzi Wells. The commissioner had risen from his chair and stepped onto the scorer’s table. He represented the voice of authority, in charge of overseeing the referees and maintaining order on the court. If coaches wanted to argue a point, they walked down the sideline to plead their case with the game commissioner. Every game had a different commissioner, and tonight’s commissioner could have been a Vegas lounge singer: He was holding a microphone and wore a white dinner jacket, his hair swept over his forehead. Throughout the game, Wells had barked at the referees, complaining about foul calls until the commissioner had intervened. “Next time we’ll give you a technical foul,” the commissioner warned. Wells was dripping in sweat, furious. A player for the Tianjin team made two foul shots. As the Shanxi lead had evaporated in the fourth quarter, Bonzi was increasingly agitated at the refs. He was getting no respect and no calls. “Always follow the rules,” the game commissioner intoned, stepping off the table. The Brave Dragons’ lead had shrunk to two points. There were twenty-five seconds left in the game. Bonzi brought the ball upcourt and was immediately fouled. He walked slowly to the foul line as his cheering section slammed together their thunder sticks. He had shot so many times that his arms must have felt limp. The referee handed him the ball. The Taiyuan journalists were typing blog updates as Bonzi bent his knees and flicked his first foul shot toward the goal. Good. The thunder sticks crashed together. Weiss watched from the sideline as Wells pounded the ball against the floor and stared at the basket. His wrist snapped. Good. Four-point lead. Now the Tianjin guards raced up the court, seconds ticking down, and one of them pulled up and fired a 3-pointer. Good. One-point game. But the clock expired. Shanxi won, 107-106. 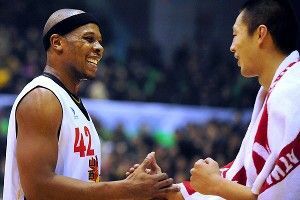 Bonzi Wells was 1-0 in China. On the bench, Boss Wang was grinning. The postgame news conference was conducted in a small room in the basement of the arena. Elated, Weiss offered some valedictory comments and praised Bonzi for playing almost the entire game, despite not having played competitively for so many months. Then Wells took the microphone and the Chinese reporters edged forward. He had scored 48 points in his Chinese debut, though he took 46 shots to do it. It was not always pretty. He thanked Weiss and thanked his new teammates. Then he pointed upward and thanked God. He had no way of knowing what was in store for him.